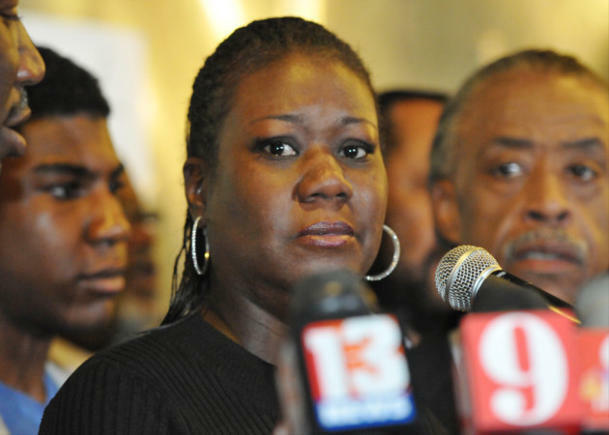 Trayvon Martin's mother Sybrina Fulton is seeking to trademark phrases with her son's name. According to applications filed with the U.S. Patent and Trademark Office by the family's attorney last week, Fulton wants to trademark "I am Trayvon" and "Justice for Trayvon" for use in DVDs and CDs memorializing the slain teenager. In the wake of the news that her son had been suspended from school after traces of marijuana were found in his book bag, Fulton said Monday that those leaking information were trying to blame the victim. "They killed my son, and now they are trying to kill his reputation," Fulton said. Fulton's trademark application could be fuel for critics who contend Martin's parents—and civil rights activists like Rev. Al Sharpton—are trying to capitalize on the killing for personal or financial gain. But Martin—who was unarmed when he was shot by George Zimmerman, a neighborhood watchman, in Sanford, Fla., last month—and the hooded sweatshirt he was wearing at the time he was killed, have become symbols of the country's racial divide and the pursuit of justice. Martin's family may simply be trying to gain some control over his name, which has been cropping up on t-shirts and hoodies across the country. Zimmerman's image, meanwhile, appears on a t-shirt that is causing even more furor in Florida. Zimmerman's face appears on the shirt under the phrase "P*** A** CRACKER." A photo of a Florida rapper—Plies—wearing the shirt was posted on Twitter, sparking outrage among Zimmerman's supporters.